Colombia: UFO Over the Barrancabermeja Refinery. Two unidentified flying objects were photographed as they flew over the Barrancabermeja Refinery. Photojournalist Edgar Malagón states that while on assignment at the refinery, his camera picked up two UFOs in the vicinity of the petroleum-refining complex. 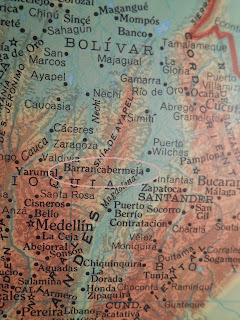 The photojournalist, with the town hall of Barrancabermeja, says that he was working on a documentary about Colombia's "oil city" when he happened to take the UFO shots. He says that the two UFOs flew over him at a distance of no more than one kilometer between himself and the clouds. They were oval in shape, perfect and traveling at high speed.